Time and again, Kristen Ashley indelibly proves why she is a master at her craft. A singularly unique storyteller with the ability to deliver feels in abundance while tackling the messiest, grayest of circumstances. Each story in the Unfinished Heroes series has unfurled from dark places, pained backgrounds, hopeless situations, impossible odds. Somehow, Knight, Raid, Creed and Deacon all found their happy, all found the woman they couldn’t build in a dream. 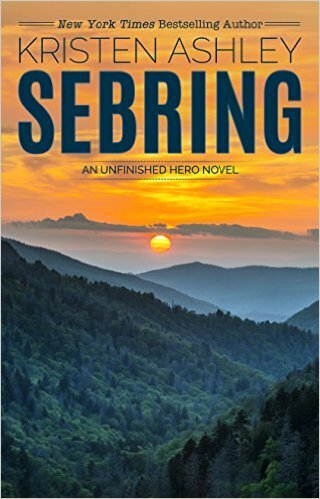 For Nick Sebring, life had begun more easily than the others, but along the way, it became twisted as he lost his way. Luckily, he found the path he’d need to traverse to help him be the man he wanted to be. Sebring, perhaps of all the stories in the series, really drove home the complexity, the duality of our protagonists. That who they were, or who they associated with, did not define who they were or could be. Nick had been drowning in guilt for what he put his brother through, for what had happened to the woman he loved. The guilt, the ache, the fire of retribution, all consumed him. For Olivia Shade, life was a thing she existed through. She did was she was told. She had already learned that lesson. Olivia was the youngest of two daughters, born to the head of a crumbling drug empire. As ‘The House of Shade’ began to topple, the future was just as bleak as her existence. The void, the numbness, the hopelessness consumed her. Empty with nothing but dreams. In a world gone shallow. In a world gone lean. Nick needed revenge on Vincent Shade, and the only way in was through Olivia. The plan hinged on getting Olivia to trust him, to give him the in he needed to enact his plan and end Vincent Shade once and for all. But his plan did not count on Olivia being who she was. Nick and Olivia collide fast and furiously, in a way neither expected. It was a hot, unbridled tumble in the sheets. It was passion, need, escape. It was not supposed to be real. It was not supposed to be feelings. It was not supposed to be something that made Nick rethink the plans he’d spent years on. The more Nick peeled back the many tightly glued layers of Olivia Shade, the more emotion inside him raged. Olivia was not who he thought she’d be. She lived in a prison of her father’s making. Caged in by reminders of what she could never have. Marred by the impossibility of her broken dreams. Suddenly the only thing that mattered to Nick was getting Olivia out of her dark, making her believe there was more to her life, and giving her the beauty of being loved, being free. This story was an emotional gut punch. It was achingly sad. It was watching two people come together, fall in love, grasping on to a hope that they could make it through. Surrounding them, however, was so much violence, corruption and disregard for the things and the people who matter. I loved this book. Loved Livvie and Nick’s journey. Loved how it was this gripping story of second chances, hope rekindled and family… how it should and should not be. I’m not a crier, but whoa… one scene in particular just gutted me. It was beautiful. Sebring was the perfect finale to such a tumultuous series. Nick and Livvie’s love was certainly that—tumultuous, frenzied, volatile—but also such a powerful thing to see unfold on the page. Add to that the unconditional loyalty and love of Knight and Anya Sebring, and the cast of characters who knew what it was like to be loved despite of their transgressions. I devoured every page, each bleeding with emotion, and loved every word until the end. Perfect.